Luggage allowance is always an issue when heading off on holiday - so we want a decent camera that will allow us to capture great pictures but travel light. 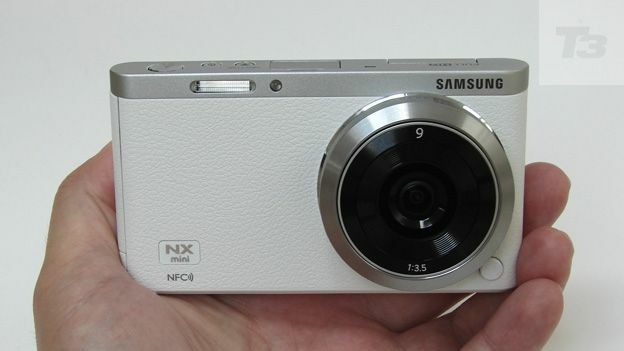 Enter the diminutive Samsung NX Mini. For a suggested £275, this is an interchangeable lens device that we feel you really need to pick up and play with to get an idea of how small, or rather slim it is in comparison with the vast majority of compact system rivals. As the name indicates, this is the manufacturer's most compact camera in its NX line up to date, measuring a mere 22.5mm in depth and 158g in weight; in other words not greatly different from a fixed lens pocket snapshot. Unlike previous Samsung NX models, however, the Mini version doesn't encompass a larger than average APS-C sensor, as found in consumer level digital SLRs. Instead we get a mini one-inch sensor, a format until now only really given much patronage by Nikon, via its '1' system cameras. While a downsizing of the sensor may feel like a compromise here, it's a relatively minor one. Premium compact cameras without the ability to swap lenses such as the Sony RX100 Mark II have long favoured one-inch chips and commanded prices of almost £700 for the privilege, so we're hardly pulling a face. Like Sony's examples, Samsung has also crammed its chip with plentiful pixels, providing a respectably high 20.4 MP effective resolution, and an ISO sensitivity range topping out at ISO12800. We also get the chance to shoot uncompressed Raw files alongside super fine (least compression) JPEGs, just like the more grown up Samsung NX models. For the most compact combo package possible, we were supplied the camera with the fixed focal length 9mm short-profile 'pancake' lens - the equivalent of a catch all wide-angle 24mm - which offers a so-so-ish f/3.5 aperture; so suggesting a jack-of-all-trades rather than a specialist master of a lens. This is the basic kit option after all. While a small camera and compact lens has its advantages for shoot-from-the-hip street photography, we were less impressed with Samsung's continued patronage of the fingernail-sized and fiddly microSD card. In fairness we get the now regulation issue Wi-Fi and NFC connectivity options in terms of photo sharing however, despite this being the 'mere' entry level model in the range. So that's the theory; but does this slender, minimalist camera add up to a big deal in practice? As we noted in our intro, this is one camera that's worth handling in your local camera shop prior to purchase, to determine whether it feels just a tad too small or just right in the hand. For us, fortunately, it's the latter. Given that this camera is all about minimalism, leather effect front and rear padding are provided in lieu of an actual handgrip - though an actual grip would have been better. Still, the compact lens on offer here at least ensures that the camera doesn't in any way feel front heavy, or like it will topple out of your hand. One thing to be aware of though: the NX Mini's narrow depth means that the exposed sensor sits very close to the lens mount - the closest we've seen, in fact - so care needs to be taken when swapping lens options that fingers and thumbs don't come into contact with its delicate parts. The bundled pancake lens doesn't come with any lens cover either, of the clip-on or automatic variety - but at least in this way it is 'always ready' for that photo (or video, courtesy of Full HD clips) opportunity. Despite the fact that the NX Mini's tilting back screen offers touch screen control - in lieu of an eye-level viewfinder - with selectable on screen icons for shooting modes, there are additionally as many physical buttons ranged to its right as one would expect to find on any non-touchscreen compact. Thus we get a familiar set of multi directional cross keys for tabbing through menu screens and captured images, plus shooting modes (here just known as 'mode'), with dedicated playback and delete buttons both above and below. As we've found in the past when using rival models such as the Panasonic Lumix GM1 models, such a marriage of soft and hard keys actually makes for more intuitive use, rather than a confusing mix. Mini this camera may be, but the entry level 'NX' from Samsung still finds space for the regulation-issue 3-inch, 921k-dot resolution LCD screen. Plus it's a tilting one at that, able to pivot so that it faces the subject in front of the camera for the inevitable selfie, with the added ability to trigger the camera's shutter via a wink. Naturally Samsung has previous as regards such screen technology, and here its visibility looks as great when composing pictures as one would expect. As we've noted, it also doubles as a touch screen; so there's the ability to direct the camera's focus by touching a point within the frame (as with Olympus' Pen camera range), or likewise fire the shutter and take a shot with a simple finger tap. Again, using the top mounted shutter release button may be the more obvious choice, unless that is you want to be surreptitious with your shooting. And with a camera this diminutive that's always a possibility. We were recently impressed with the 410 shot battery life of the Kodak S-1 system camera; but the NX Mini raises the bar further still by offering 650 images from its own fully charged battery. Unusually, the battery compartment isn't found at the base of the camera, but rather at its side, where connectivity ports and a vacant slot for optional microSD card can also be discovered. This means both battery and card can be swapped without the camera having to be unscrewed from a tripod, should one be in use. Colourful results are achieved with the supplied lens, but for video, which has its own record button top right of backplate, a zoom might be a better bet in terms of affording more choice than simply the option of shooting wide all the time. In this sense, operation of the NX Mini is indeed all about pointing and shooting. Nothing wrong with that of course and this Samsung is a natural step up for anyone previously used to shooting with a smartphone. The camera is reasonably responsive too if not quite ultra fast, the focus visibly adjusting as you half press the shutter release button before we get a bleep of affirmation that we're ready to take the shot. It's worth noting too that while we do get smooth 30fps video at the Full HD 1,920 x 1,280 pixels, the sound on this camera is mono only, when almost anybody who is anyone these days is offering stereo sound as a basic default. While if the NX Mini is left to its auto devices some very reasonable results can be achieved - and despite the maximum f/3.5 aperture not being especially bright/fast we did manage some pleasant shallow depth of field results in close up. If upping the ante and stretching to ISO12800 setting you won't be surprised to learn that such frames take on a painterly looking aspect slightly more soft on detail. Cramming too many pixels onto a small-ish chip is never a great idea, and obviously there has to be some compromise here. This is neither Samsung's flashiest or best system camera - head further up the range to the likes of the Samsung NX30 or older Samsung NX300 for that. But, for those wanting best quality travel photography from a minimal outlay and bulk, Samsung's smallest system camera to date takes some beating as a fuss free photographic option. So while if you can stretch to a little more you might walk away with a significantly better camera, current pricing just shy of £300 and with lens included feels like fair value for the first outing of the 'Mini' option.